If you own a credit card, you have probably had at least one unpleasant experience. It could be due to a missed payment or a check that didn’t clear, or even a check that was never received! It could be due to inconsiderate customer service people or features that changed without your knowledge. Whatever it is that you dealt with, you are probably not alone, as there are many complaints involving credit cards filed every day. If you have a legitimate complaint, you need to prepare yourself for what could be a long and arduous fight. However, with the right information and a little determination, you will indeed come out victorious. Most complaints involving credit cards are in reference to fees and penalties. Unfortunately, credit card companies are often in it for the profit, and they will find unique ways to assign you fees if they can. This is not necessarily illegal, though it is a bit devious, but you can avoid these problems by understanding how they design their programs. For instance, did you know that you can get a late fee even if you send in your payment early? It can happen if the check you write is missing a piece of vital information. While you might think that your name, address, and signature should be enough, your credit company could technically assert that it took longer than expected to process your payment because you didn’t include your account number on the check. While many people can now pay online or over the phone and thus avoid this issue, it still serves to show that many complaints involving credit cards are often related to some shady practices. Similarly, some complaints involving credit cards are in regards to over-the-limit or NSF charges. These fees are often quite substantial, sometimes unreasonably high, charges that are assessed if you charge over your limit. While previous generations of credit card companies would supply deny your card because of this, contemporary companies have learned that they can charge you extra if they simply pay for anything you charge, regardless of your limit. This is actually an often convenient feature if you need to use your card to make a purchase. However, on some occasions you can be pushed over the limit by late fees, interest charges, finance charges, and annual fees. If this occurs, your bank or credit card company could potentially charge you another limit fee! This is not always something that you can control and after the first charge, it can quickly sky rocket if you don’t take care of it immediately. In the past, there have also been complaints involving credit card interest rates. There have been reported cases where a card holder noticed that the interest rate they were paying was higher than what they expected. Perhaps this was due to some conspicuous marketing or perhaps it was simply a devious plan to begin with. It is considered abuse by the appropriate authorities and definitely worth investigating and reporting. If you do indeed have complaints involving credit cards the first thing that you should do is try to resolve it with the credit card company. While this is never any fun, especially since they often have well-practiced professionals who specialize in handling these cases, it is a necessary step because it will save you the time and trouble of having to go to court. If the issue is something minor, they might resolve it with you in hopes to keep your business. If your experience with this company was good aside from this issue, then you might decide the settlement or agreement is worth salvaging. Of course, if they cannot seem to reason with you, you don’t have to accept their terms. When it gets to this point, you need to report to the appropriate authorities. There are different agencies that you can report to, depending on the type of bank or financial institution you were dealing with. Whether it was a National Bank, a card issued through the Federal Reserve System, or a Federal Credit Union, you need to make sure that you take your issues up with the appropriate agency. This will expedite the process and put your complaint in the right hands of a capable professional who will attempt to find a solution to your problem. 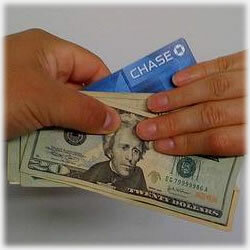 At this time, you can let them deal with the professional that your card issuer has hired to protect their interests.